What really makes a mediator effective? Are the skills you use as a mediator the same that other people use? Do you try to specifically do certain actions while also avoiding others? Drawing on his doctoral research, Jeff Thompson addresses the complexity of these questions. Central to his work are understanding the development of rapport, building trust, and the display of professionalism. Each is examined through nonverbal communication, and is observable through the mediator’s actions during his or her introduction. The complexity of mediation, the existence of various mediation models, and the vast number of personal styles of individual mediators all contribute to the challenges experienced by a researcher who attempts to identify specific actions, verbal or nonverbal, used by mediators. The building blocks of effective mediators are offered through three studies Jeff conducted. First, a survey of almost 400 mediators worldwide provided both quantitative and qualitative data, giving insight into a variety of topics related to nonverbal communication. Second, ethnographic interviews of mediation trainers and professors were conducted to find out how mediators are being taught nonverbal communication, rapport, trust, and professionalism. Third, observation of mediators to understand what they actually do, with specific emphasis on the mediator’s introduction. In his presentation, Jeff will discuss the interplay of all this research, and explain not only what actually works in mediation, but also how much of what ADR professionals accomplish is done through nonverbal communication. Jeff Thompson, Ph.D., is a NYPD Detective and is a crisis negotiator with the Hostage Negotiation Team. He also is a researcher, mediator, and trainer. He was a recent Research Fellow at Columbia University Law School researching law enforcement crisis and hostage negotiation. 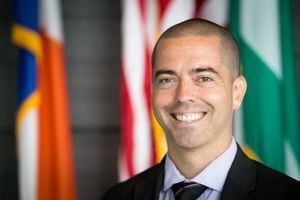 Additionally, Detective Thompson received his Ph.D. in conflict resolution from Griffith University Law School and he has a MS in Negotiation and Dispute Resolution from Creighton University School of Law. He has designed police training programs that promote the use of mediation and negotiation skills.